1 Place the ribs on a large piece of double-thickness foil. In a jug, mix the hoi-sin sauce, honey and ketchup and pour over the ribs, coating them well. Scrunch up the foil loosely and twist to make a sealed parcel. Marinate in the fridge for 1-2 hours. 2 Toast the sesame seeds in a small, hot non-stick frying pan for 2-3 minutes, stirring all the time until just golden brown. 3 If cooking on a barbecue, make sure the coals are glowing red under a thin layer of ash. Alternatively, preheat the oven to 200°C/R6. 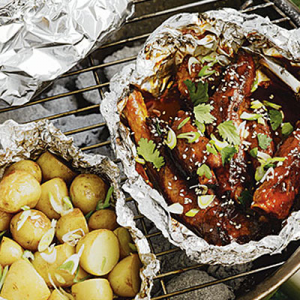 Place the ribs in the foil on the barbecue or in the oven and cook for 30 minutes. Open up the foil and cook for a further 25-30 minutes until the meat is thoroughly cooked. 4 Meanwhile, spray the potatoes with oil and sprinkle with sea salt. Place in a large sealed foil parcel to barbecue, or on a baking tray to oven roast. Barbecue or roast for 30 minutes until the potatoes are tender. 5 Pour any remaining sauce in the foil over the ribs and serve, scattered with toasted sesame seeds, coriander and half the salad onions. Top the potatoes with the remaining salad onions and serve with a crisp green salad of Romaine lettuce.